I was surprised the other day when I noticed that the repaired steps at the Mayfair Drive entrance to the narthex had finally been graced with railings. Back in August, I had asked “Where Are the Railings?” so it was gratifying to see that railings had finally been installed. Of course, the railings are not totally dissimilar to the railings on the front steps, on the steps leading from the sidewalk to the Mayfair Drive entrance to the narthex, or on the steps at the entrance near the church office. 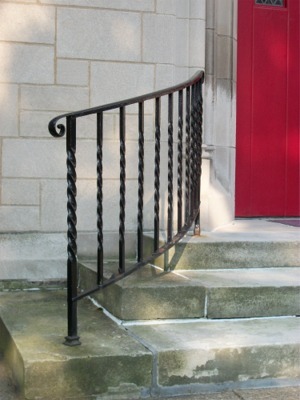 All have similar balusters, with heavier balusters at the ends. 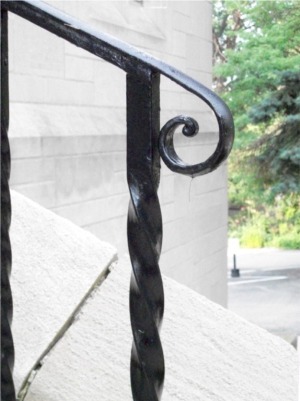 Whereas all the other railings have handrails that terminate in a simple curve—see photo below—the new railings end in ungainly extensions supported by extravagant, curvaceous wrought iron constructions. 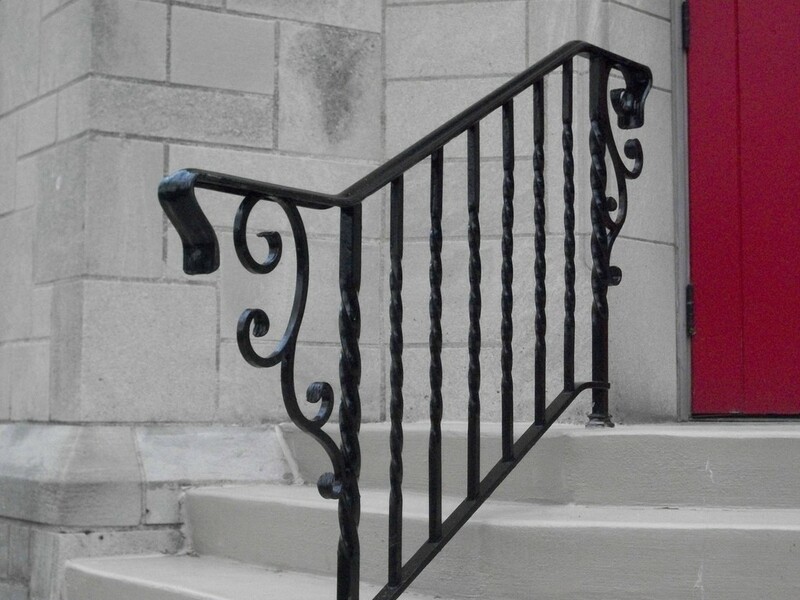 Rather than looking like appliances one might see on an English country church, the new railings seem more appropriate for a New Orleans whorehouse. How do these architecture disasters happen? 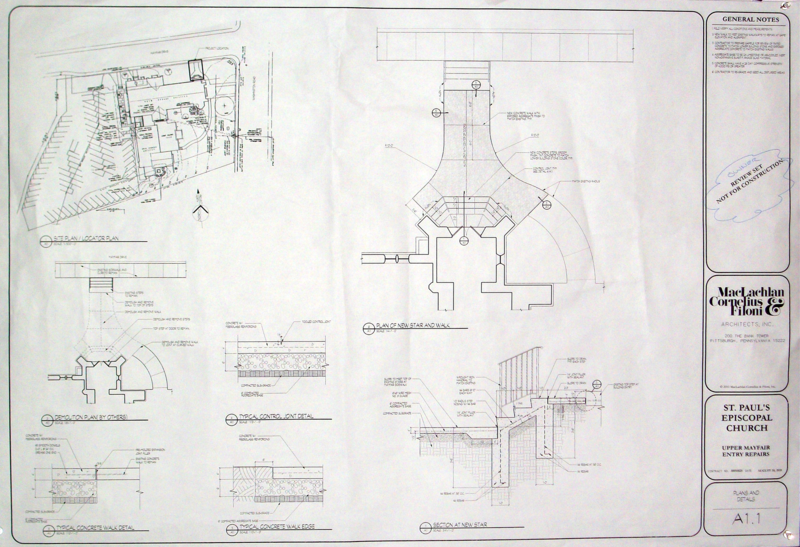 Plans for the project were posted without comment in the undercroft in September 2010. (See “Good News/Bad News.”) Those plans—see detail at right—carry this note: “WROUGHT IRON HANDRAIL TO MATCH EXISTING” In no way do the new railings conform to that instruction! Of course, as I noted in my post “Construction Progress?” the plans also carry this note: “NEW CONCRETE STEPS, BROOM FINISH, TINT CONCRETE TO MATCH LOWER BUILDING STONE COLOR TYP [typical]” The new steps in no way match the limestone of the building. One wonders if St. Paul’s hired an architect to draw up plans for the steps but saved money by not engaging the architect to oversee construction and assure that it was consistent with the plans. I am very anxious about the projects being funded by the recent capital campaign. (I plan to discuss this in greater detail in a future post.) 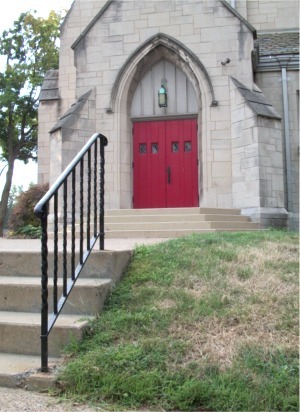 The rebuilding of the narthex steps was planned without a call for parishioner input—I would have argued for limestone steps to match other steps to the building, even though the steps being replaced were concrete—was not completed according to the architectural plans, and required at least 15 months after plans were drawn up. Will other projects be executed with equal nonchalance? In describing my experience at the St. Paul’s Thanksgiving service—see “Thanksgiving Review”—I failed to mention some things we do that are unwelcoming. I want to redress that oversight here. Particularly now that we are facing months of cold weather, the cloakroom off the undercroft will be getting a lot of use. Why is it that no one seems to think of turning on the light in the room to make it obvious to everyone, even visitors, what the room is for? Given the location of the Coke machine, it would be easy for someone to think the room is for vending machines. I use the cloakroom a lot, and I usually throw the light switch when I enter it. This leads me to another observation. Unlike most people, I often wear a hat. Even if I’m not wearing a hat, I may have a book, music, or other baggage with me that I need to park somewhere. Unfortunately, the shelf above the clothes hanger in the cloakroom is often taken up with junk that no one seems capable of finding a place for. This is inconsiderate. Also, there may be mops or other objects in the cloakroom. This is not an inviting environment for member or visitor. The cloakroom should be inviting and functional. It seldom is. I tried—unsuccessfully, it turns out—to convince Jane Little that she wanted to join me at the Thanksgiving service. Jane spends most of her time in a wheelchair, and being in her wheelchair would certainly have been a prerequisite of her attendance. The obvious place to park a wheelchair in the church is in the first pew in front of the pulpit. The modesty screen is truncated there to allow placement of a wheelchair. I noticed Thanksgiving morning that the end of the piano was nestled into that spot, making it impossible to place a wheelchair there. Such a welcoming gesture! The chair of the Transition Committee for our next bishop, the Rev. Nancy Chalfant-Walker, will be hosted by Progressive Episcopalians of Pittsburgh in a program tonight. Nano is well-known by St. Paul’s parishioners, as she recently served as the parish’s interim rector. She now heads the committee that manages the selection and consecration of the next Bishop of Pittsburgh once the slate of nominees is fixed. Chalfant-Walker will discuss the work of her committee at a program that begins at 7:30 PM at St. James, Penn Hills, 11524 Frankstown Road, Pittsburgh, PA 15235-3199. Our program will be a conversation with the chair of the bishop’s transition committee, the Rev. Nan Chalfant-Walker. The transition committee picks up responsibility as soon as the final list of candidates is determined. This committee shapes the way the walk-abouts will be structured and how the electing convention will be run as well as planning the consecration, farewell to Bishop Price and the support of our new bishop as he/she begins to really connect with the diocese. This is YOUR CHANCE to give input on how you would like to see the walk-about sessions go. This will be the main interaction any of us will have with the candidates before our new bishop is elected. Come on Monday and get your 2 cents in! I didn’t count the number of people in the congregation, but attendance was respectable for what is not a traditionally well-attended service. If my memory serves me correctly, Mt. Lebanon used to offer an ecumenical Thanksgiving service that was held at a different church each year. Since I never attended one of those services nor attended a Thanksgiving service at St. Paul’s, I don’t really know what passes for normal. In any case, yesterday’s attendance was not embarrassing. Also, I was pleased to see our youth participating, both as acolytes and ushers. No one had turned on the lights on the high altar. This made the front of the church look darker than usual. The darkness in the chancel was enhanced by a burned out bulb in one of the chancel lanterns. From my vantage point, I could clearly see the outline of the non-working light bulb. No one turned on the light above the pulpit. The pulpit spots were on, however, so readers could be seen reasonably well. The flower stands were well-lit but conspicuously free of flowers. This seemed particularly unfortunate on a day when we were counting our blessings. No traditional Thanksgiving symbols were in evidence anywhere in the church. When I began attending St. Paul’s, it was hardly the perfect parish. When it came to worship, however, St. Paul’s was obsessively attentive to details. If ever anything went wrong, everyone knew there would be hell to pay. That attitude is but a distant memory. That’s too bad. I really dislike leaving church with a mental list of all the environmental factors and actions, intentional or not, that detracted from the spiritual value of the service. No doubt, many view this blog as rather negative in its outlook, even when it addresses issues that need to be discussed. Today is Thanksgiving, however, and a more positive message is in order. And so I offer my poem “Thanksgiving,” which you can find on my Web site here. Have a wonderful Thanksgiving! As I write this, it is not too late to plan to attend the Thanksgiving service at the church. It begins at 10 o’clock. 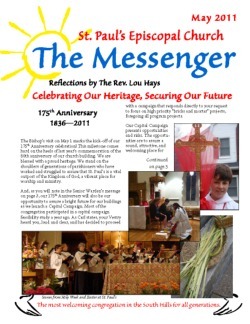 Back in September, I observed ruefully that the latest issue of St. Paul’s’ newsletter, The Messenger, on the church’s Web site was the May issue. Today, not being able to put my hands on the latest issue quickly, I went to the St. Paul’s Web site in hopes of finding the November edition. Guess, what—the latest issue on the Web is still the May issue. The Messenger page is now half a year out-of-date. This discovery was irritating, but it is more than that. If I were church shopping, I naturally would check out the Web sites of any churches I was considering joining. 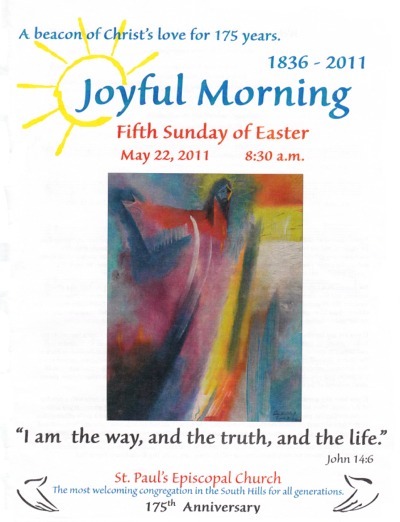 One of the best ways of getting a feel for the character of a parish is to read its newsletters. Not only does the lack of current newsletters on the Web fail to give the visitor a sense of what’s currently going on at a church, but it also suggests that the church is not particularly concerned about communications, a function that many church theorists consider to be of very high importance. St. Paul’s seems to be pretty good about communicating the need to pledge to the annual stewardship campaign and to the capital campaign. Too bad it isn’t equally obsessive about its Web site. For the benefit of St. Paul’s parishioners, I should mention the St. Paul’s people who were elected to various positions. Lou, who has already served one term on the Committee on Constitution and Canons, was re-elected to a clergy position. He was unopposed, an indication that most of the urgent governing issues that needed attention following the October 2008 schism have been taken care of. St. Paul’s used to be in District 5. It is now in District 3, reflecting the realignment required after the diocese became suddenly smaller. It is to be hoped that districts will again become important mechanism for consultation and fellowship in the diocese, but District 3 has a long way to go in that department. The district continues to be dominated by its largest parish—ours. Jon Delano was re-elected district chair, and Kris McInnes was re-elected vice-chair. Our representative to Diocesan Council, a position of some importance, has been held by Bob Johnston. His term ends this year, however, and Bob was quick to nominate someone else, Jeff Dunbar, to take his place. Jeff was elected without opposition. St. Paul’s celebrated it 175th anniversary this past weekend and kicked off the public phase of the new capital campaign. Events began Saturday evening in the undercroft with food and drink—wine and beer were available. (The huge shrimp that were served were very good. Next time we should have real wine glasses, however. The flimsy plastic cups used for serving wine were clumsy to handle.) We even had piano music from time to time. The event was well attended—the special personalized name tags were a nice touch—and there was much conversation. (See picture below, and click on this and other pictures for a larger image. After an hour of socializing, the crowd was herded upstairs for a formal program.This was a great disappointment and belied the reassurances that were given that the anniversary, rather than the capital campaign, would be stressed. (See “Promoting the Capital Campaign.”) Admittedly, no one was actually asked for money on the spot, but there was little celebrating of our past, a good deal of self-congratulation regarding our present, and much rhetoric about the need for the capital campaign to “secure our future.” The annual stewardship campaign also got time on the program. I will not bore you with a full description of all the little talks to which attendees were subjected, just as we were told that we would not be bored by a reciting of the church’s history. (Actually, I thought that “celebrating our heritage” was the main point of the evening!) The only historical events in the history of St. Paul’s that were stressed were the construction of the church during the Great Depression and the subsequent additions a quarter century later. It was easy to see where this was going. A brief video by Tyler Anderson of parishioners talking about the church was shown. I was sitting near the front and could see it reasonably well, but the projector was not powerful, and the lights were left on in the nave, so I doubt the people sitting at the back had a very good view. The program concluded with the singing of “Lift high the cross,” and everyone adjourned to the undercroft for dessert. 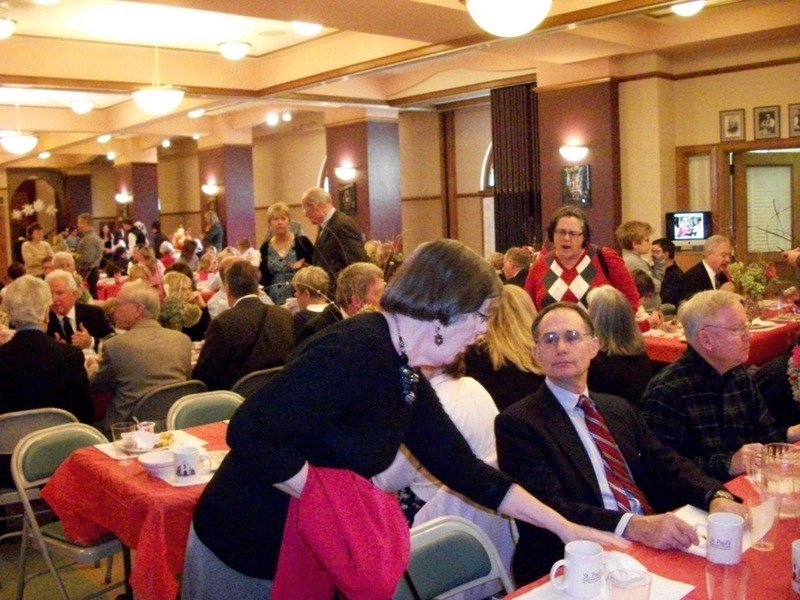 The celebration continued Sunday morning with a brunch that began at 9:30. The picture below from that event also shows the computer monitor set up near the library that was part of one of the most engaging elements of the weekend. It displayed a slide show of pictures taken at St. Paul’s, some of which were from decades ago. I expressed the hope that the slide show would find its way to our Web site. The late Sunday service was moved to 11 o’clock and was less remarkable than the printed service bulletin might have led worshipers to expect. It, too, ended with “Lift high the cross,” which I was told is a Bill Pickering favorite. 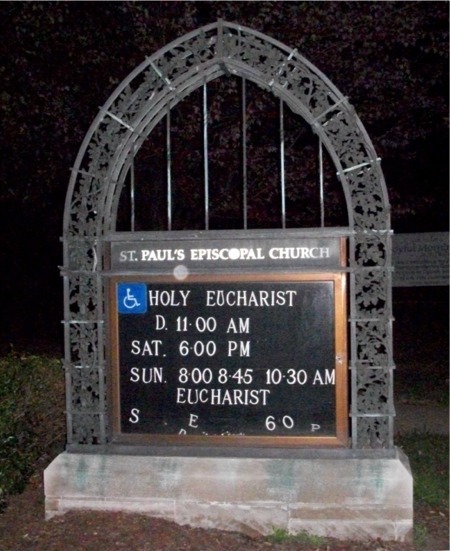 Printing the entire service provides many opportunities for error, and St. Paul’s took full advantage of them. The first hymn, “Christ is made the sure foundation,” for example, was printed on pages 3 and 4, which meant that one had to constantly turn pages while singing the hymn. As a choir member, I would have preferred not to carry my hymnal, but I did so anyway to make processing easier. In the Prayers of the People, we prayed for “our Presiding Bishop Katherine.” Of course, the name of the presiding bishop is Katharine Jefferts Schori. More serious was the substitution of “God’s” for “his” (BCP, page 355) and the substitution of “God” for “him” (BCP, page 367). Many people like these substitutions, but it is improper for a church to change the BCP liturgy. The service included “The Commissioning and Blessing of Stewardship and Capital Campaign Leaders.” Some of those leaders have been at work for some time without the benefit of commissioning or blessing. Well, better late than never. Acknowledgement was also made of the 30th anniversary of Mary Weatherwax’s ordination. Interestingly, Ken Price was on the West Virginia Commission on Ministry when Mary was approved for ordination in the Diocese of West Virginia. The Episcopal Church is a small world. On Saturday night, we were told that pledges of $450,000 for the capital campaign were in hand. That figure became $480,000 Sunday morning. Perhaps my hearing or notes are suspect. Perhaps the campaign is going very well. Perhaps one hand doesn’t know what the other hand is doing. St. Paul’s does not always do a good job of getting publicity in local media for its programs and events. 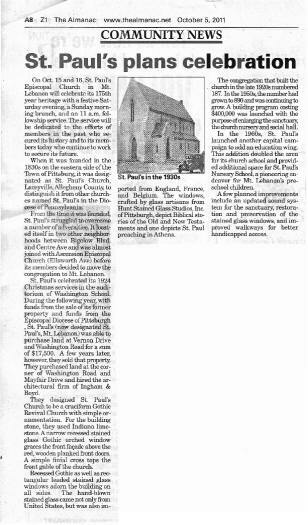 The church got a nice story placed in The Almanac about the events this weekend regarding our 175th anniversary, however. St. Paul’s celebrated its 1924 Christmas services in the auditorium of Washington School. During the following year, with funds from the sale of its former property and funds from the Episcopal Diocese of Pittsblirgh, St. Paul’s (now designated St. Paul’s, Mt. Lebanon) was able to purchase land at Vernon Drive and Washington Road for a sum of $17,500. A few years later, however, they sold that property. They purchased land at the corner of Washington Road and Mayfair Drive and hired the architectural firm of Ingham & Boyd. The story is very good publicity for St. Paul’s. When I received my invitation to the Festive Evening tomorrow, I was a bit put off by the information that we would “Celebrate our 175th Anniversary and Kick off our Capital Campaign,” and I quickly checked with people who should know that the anniversary celebration was not simply an excuse to give parishioners the hard sell on the capital campaign. Presumably, I was not the only person who harbored such suspicions, as Lou has emphasized in church that there will be no soliciting at the Festive Evening. Yesterday, I received my weekly electronic newsletter. 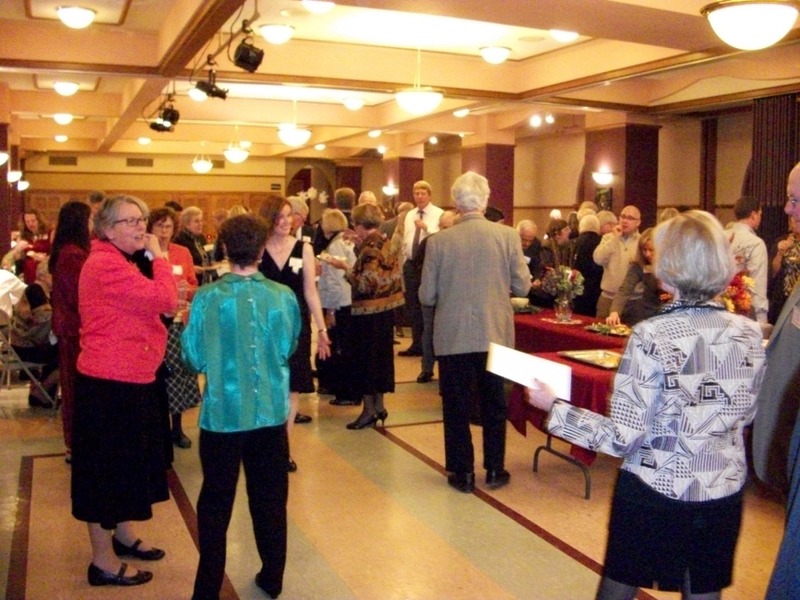 I was surprised to see next Saturday’s Mike’s Episcopal Café listed as a “Capital Campaign Fellowship Event.” Mike’s Episcopal Café has, for a number of years, been a fund-raiser for the music program put on by members of the choir. The newsletter made it seem as though the event had been hijacked to benefit the Capital Campaign. As it happens, the church wanted the choir to cancel the event, presumably because it was seen as competing with the Capital Campaign. A compromise was reached whereby, during the serving of dessert, attendees will be subjected to a 10 to 15 minute pitch for the Capital Campaign and the stewardship campaign. This arrangement seems rather like blackmail, but others will perhaps not find it objectionable. In any case, do note that proceeds from Mike’s Episcopal Café go to the music program, not to the Capital Campaign. As for the Capital Campaign itself, let me again say that I think that more parishioner involvement is called for. I believe that many specific projects are ill-conceived and that most projects are so vaguely specified that they are impossible to evaluate. I am troubled that so many prominent parishioners have lent their support to such a poorly conceived and poorly marketed enterprise. The Episcopal Church celebrates the life of Francis of Assisi on October 4. October 2 is the Sunday nearest to that date, and St. Paul’s will bless animals then. People are encouraged to bring their pets to the 8:45 AM service. 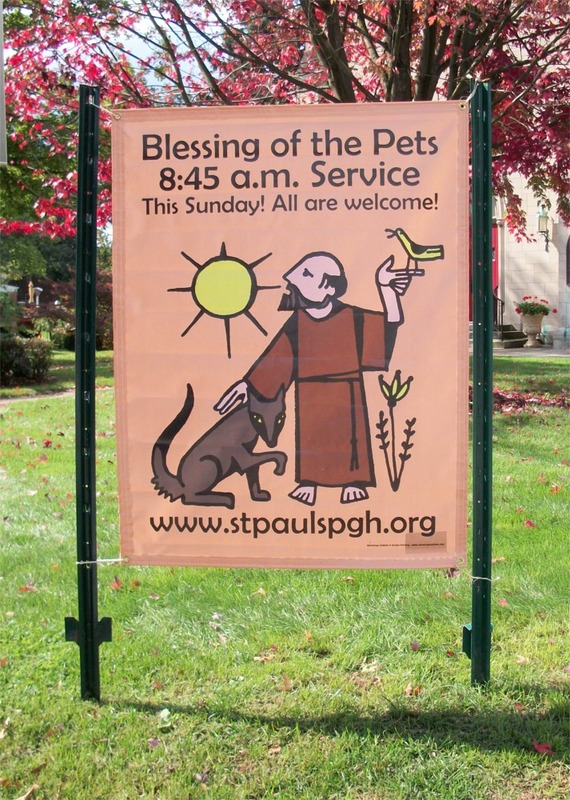 Animals will also be blessed after the 10:45 AM service. I really do like this celebration, but it is sometimes hard for people to participate. It is particularly hard for choir members. Running home after the late service to retrieve my cats has, in the past, meant that I have missed most of the blessings. And of course, much of the joy of the event is seeing everyone else’s animals. The banner faces traffic going south only. The words on it probably couldn’t be read from across the street anyway. You can see where the banner has been placed in the photo below. Today, I want to offer several short items. I have been running a series of posts on Lionel Deimel’s Web Log looking back on poems and essays I wrote in response to the attacks of September 11, 2001. In my most recent post, the eighth in the series, I talk about and reproduce my poem “9/11 Memorial.” The poem describes the service held at St. Paul’s on the evening of September 11, 2001. If you attended that service, my poem may bring back memories. I last complained about lights for the parking lot being out May 13, 2011. (See “Physical Plant Notes.”) When I was leaving the church for home after choir rehearsal on September 9, the three lights on the building that are supposed to illuminate the parking lot were not working. This is really dangerous. I was backing up my car near the door where I knew choir members were exiting, yet it was difficult to see if anyone was behind me or not. Happily, I ran over no one. The good news is that, after the September 15 choir rehearsal, the lights were on. I had reason to look at back copies of our newsletter, The Messenger, the other day. I do not save my copies on the theory that I can always go to the church Web site to read older issues. To my surprise, the current issue of the newsletter (i.e., the September issue) is not on-line. More surprisingly, the June, July, and August issues were also missing in action. Why can’t our Web site be more helpful and more up-to-date? By the way, it’s possible that some parishioners visiting the Web site may have a hard time finding any issues of The Messenger at all. There is no obvious link to the newsletter page on the site’s home page. One has to click on the About tab at the top of the page to find a link to copies of the newsletter. And one more thing. (This is something I have to think about as the Webmaster of a number of Web sites.) The footer at the bottom of pages on the St. Paul’s Web site carries a 2010 copyright date, yet another indication that the site is updated only fitfully. 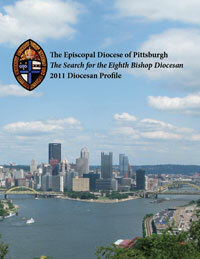 The Episcopal Diocese of Pittsburgh has recently published its Diocesan Profile, a kind of recruiting brochure—one of nearly 30 pages in this instance—for potential bishops. I wrote a brief post about it on my blog when it was first released and wrote a more extended reflection on it a day later. All interested Pittsburgh Episcopalians should read the profile. That blog is now active and, as I write this, has a single introductory post. The blog home page can be found at http://ourpghdiocese.blogspot.com. Bruce and I will be writing essays for the blog—anyone can comment on posts, of course—but we hope that most essays will be submitted by the clergy and laypeople of the diocese. Why not join in the conversation? You can influence the search process even more directly by submitting the name of a possible candidate. A form for submission can be found on the diocesan Web site here. The process is exceedingly simple. I was pleased to see that the lantern at the crossing nearest the font was operating again today. (See earlier story here.) Like a similar lantern in the chancel some time ago, the lantern had to be completely rewired. A spotlight on a roof truss and a downlight on the ceiling are still not functioning, presumably because the lamps are burned out. I reported more than a year ago that the south-facing body of our outdoor sign was dark at night. A couple of nights ago, as I drove past the sign, I saw that both sides of the sign are finally illuminated once again. The lettering on the sign is still problematic, and the fluorescent tubes on the two sides have different spectra, but at least the sign, at some level, works. Below are pictures I took of the sign tonight from the north and from the south. The non-functioning lantern in the church has still not been repaired. (See my earlier post here.) Vladimir told me today that he thinks an electrician is going to be called this week. I asked Vestry member Jeff Dunbar about the lantern. Jeff explained that there was some confusion at the last Vestry meeting as to whether the lantern (or whatever is the problem) had been fixed or not. I don’t quite understand how the junior warden could be confused about such a matter, but the situation is what it is. I also noticed today that two lamps, a downlight on the ceiling and a spotlight on a roof truss, are out. The spotlight, as well as some other spotlights, have not been used of late because the fixtures are not aimed properly. (One shines in Doug Starr’s eyes when he’s at the organ console, for example.) I hope these problems will be taken care of as well next week, but I don’t have high hopes. A friend of mine who has mobility problems—she generally uses a walker when out and about—observed that the rebuilt steps to the narthex door do not have railings. I had not really thought about this, but, when she mentioned it, I recalled that the plans for the steps that were posted in the undercroft a year ago—without comment, as it turns out—did indeed specify railings. The issue is not simply an aesthetic one. My friend, for example, can surmount steps by having someone carry her walker and pulling herself up step-by-step using a railing. 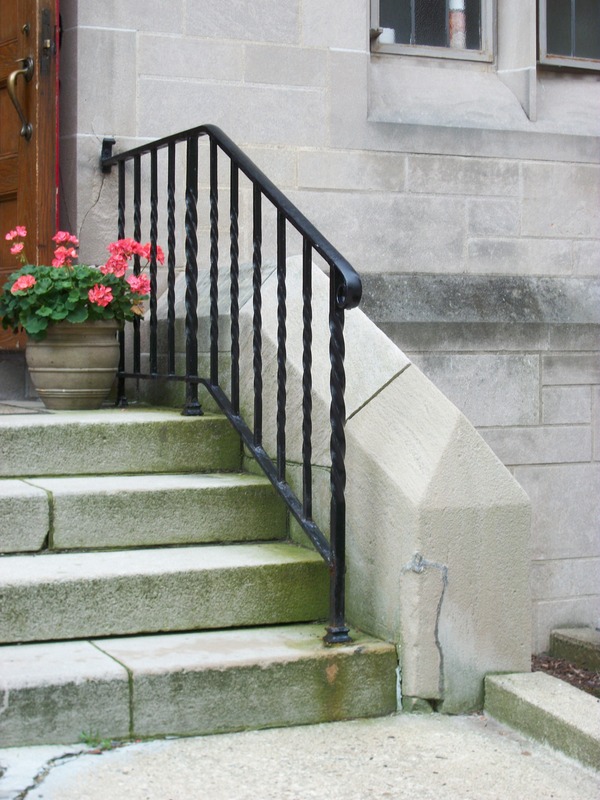 The question, however, is what happened to the railings that were supposed to be installed on the steps to the Narthex door? If you’re free, please come to tomorrow night’s Jazz Camp concert in the church at 7:00 pm. A program is attached. Always fun to watch these young folks play and improvise! Tuesday, August 2nd at 7:00 p.m. Performance Jazz Camp Description: A new, innovative and fun jazz camp for student jazz groups and individuals. The focus is on the group performance of school age students (4th – 12th grades) who are members of (e.g., duos, trios, quartets) small groups or school ensembles. PJC includes Master Class demonstrations and jazz performance coaching daily. It is a great learning experience for young jazz players. The Episcopal Church and Monk Development, Inc., have just published a brief paper called “Social Media and the Episcopal Church: A New Way to Tell a 2,000-Year-Old Story.” I have some problems with this document, but it does offer excellent suggestions about how a church should use its Web site, as well take advantage of Facebook, Twitter, YouTube, and the like. First, the bad news. “Social Media and the Episcopal Church” was posted on the Web not on the Episcopal Church site but on that of Monk Development. Moreover, one has to enter personal information to access it. (You don’t have to, however. You can simply view the PDF file here.) If you’re in a cynical mood, you might see the paper as an extended advertisement for a Monk product called Ekklesia360, which is a tool for building church Web sites. That would be a mistake. Following an executive summary, “Social Media and the Episcopal Church” discusses six “best practices.” I will list them here, but you should really read the paper, which is rather short. Churches that will flourish in the world of social media are those that understand that these are not just new tools for dumping information or pushing agendas. Social media demands transparency, openness, and a willingness to be part of a conversation. Except for the shameless self-promotion by Monk Development, I have no quibbles with the content of “Social Media and the Episcopal Church.” Read it for yourself and see if (1) you don’t agree with its contention that the new technologies are important and require deliberate and ongoing attention and (2) that St. Paul’s is doing almost nothing of what is being suggested. Last week, I complained that some of the lights were out in one of the lanterns over the altar, the apparent result of a wiring problem. (See “Safety Last.”) I happened to see Vladimir before church this morning, so I asked him if the lantern had been fixed. His answer was no, the rector and the junior warden—he may have mentioned others as well—said there was no money for a repair. Moreover, the offending lantern was now completely non-functional. When the choir went into the church to practice before the 10:30 service, Doug Starr told the choir that the lights had been turned down to reduce the heat buildup in the room. (Even so, it was hot.) Indeed, the lighting intensity had been reduced throughout the church. The two altar lanterns were off, presumably because one of them likely presented a fire hazard. Moreover, three spotlights were not functioning. One wonders if we will continue to turn off fixtures and not replace burned out lamps until the church is completely dark or the building burns down, whichever comes first. The lanterns over the altar are of the same design as those in the chancel. They are, I believe, the lanterns installed when the church was first built. As I noted in “Safety Last,” a short occurred not so long ago in one of the chancel lanterns, which had to be rewired. The conical cap on these particular lanterns holds in heat and tends to melt the insulation of the wiring, creating a short. I am glad to see that my advice of last week was implemented—the lantern has been turned off. (The two altar lanterns are on the same circuit, so both are either energized or not.) There is nothing to stop someone from turning them on again, however. In the short term, even if St. Paul’s has to borrow the money, we should hire an electrician to investigate what is wrong with the lantern. I suspect that heat has again melted insulation and caused a short. The problem could be elsewhere in the lighting control circuitry, however, so we do not actually know what the dangers are or whether keeping the two lanterns off provides safety against fire. In the longer term, both for safety and aesthetic reasons, all six “witch’s hat” lanterns should be taken down. The two in the sanctuary should not be replaced, as they are so much visual clutter. (Lighting in the sanctuary needs to be completely reconsidered, as it has not been since the exposed organ pipes were added to the church.) The remaining four lanterns should be replaced with lanterns duplicating the other lanterns in the church. These will, no doubt, need to be custom made, but the safety and aesthetic benefits will justify the expense. Why are such improvements not in the capital campaign? More significantly, do we trust the people currently responsible for church maintenance to spend money collected by the capital campaign wisely? As long as I’m writing about lighting, let me offer some additional concerns. A number of the spotlights mounted on or near the roof trusses are badly aimed. This results, for example, in some choir members having a hard time reading their music for lack of light. The problem is that the fixtures are hard to aim, may not hold their position after being aimed, and present serious difficulties when lamps have to be changed. I have no idea as to the best way to change lamps. Perhaps we need catwalks like those installed in theaters. The solution to aiming spotlights, however, is to get motorized fixtures such as those used for rock shows that can be remotely aimed. Why has no one considered this? Why aren’t such fixtures part of the capital campaign? For about a month, I have noticed that the down light on one of the lanterns at the crossing was not functioning. Today, I saw that one of the bulbs in the body of the same lantern was not working either. This fixture is especially important, as it is one of two that illuminate the altar, where the most important action of a Eucharist service takes place. How long, I had been thinking, was it going to take to change a couple of light bulbs? Before church this morning, I happened to see Vladimir in the kitchen. He is usually the person to see to take care of minor maintenance issues, so I approached him and explained the problem, assuming that he was unaware of it. My assumption was wrong. What he told me took a little time to sink in, partly because what he was saying was hard to believe, though, admittedly, Vlad’s Russian accent didn’t help. Here is Vlad’s story: He knew about the down light and had determined that the problem was not that the bulb was burned out or that no replacement was at hand. Instead, there apparently was a wiring problem. At this point, I asked if we had called an electrician. He explained that he had brought this to the attention of the junior warden, Carol Delfino, and Carol was looking for a source of funds to pay an electrician. I failed to ask how long this search had been ongoing. At this point, I was livid. Were we going to risk burning down the building because we could not afford to engage an electrician? (A few years ago, a lantern in the chancel sparked in the middle of a service and went dark. It had to be rewired, and we were told that the fault was a fire hazard.) Has anyone considered turning off the altar lanterns until we identify the source of the problem? Have we inaugurated a moratorium on maintenance in order to expand the punch list for the capital campaign? Is this worth risking a fire? Perhaps the money contributed to the Salary Restoration Fund should have been given instead to the Property Fund. I no longer feel safe in the church. One can hardly quibble with the third principle—running a capital campaign does not make routine expenses disappear. The church still needs to pay utilities, meet the payroll, buy office supplies, and so forth. Moreover, much of the capital campaign is really not targeted at funding capital expenses, but at deferred maintenance, which should be funded from annual pledges. Perhaps people should increase their pledges before considering contributing to the capital campaign. Keeping costs as low as possible sounds like a good idea at first. On reflection, however, it is worrisome. Not everyone will agree with me on this point, but I believe that, over the years, St. Paul’s has given parishioners no reason to worry that the church is a lavish spender. Some may see the Schantz organ as an extravagance, but, in reality, we bought a very fine instrument at a very attractive price. 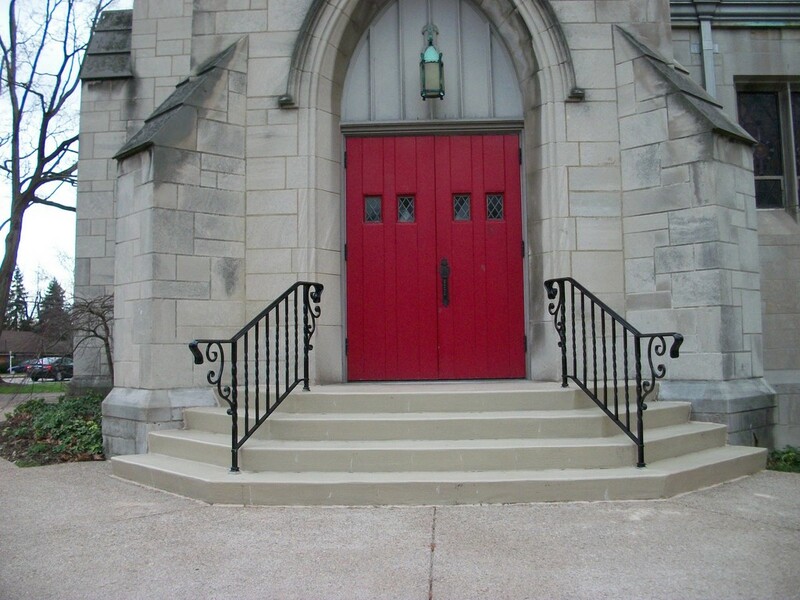 On the other hand, the recent repair of the Mayfair Drive entrance to the narthex would have benefited from spending more on limestone steps, rather than on concrete ones that are a poor match for the building exterior. In fact, the project was delayed for months because it was entrusted to the lowest bidder. The bid apparently was too low. If St. Paul’s is here for the long haul, I would be more comfortable with a commitment to durable materials and high-quality workmanship than one to low cost. Finally, the pay-as-you-go pledge may seem prudent in these tough economic times, but there are two drawbacks to the idea. First, it suggests a lack of confidence in the church’s future. This is particularly ironic in our 175th anniversary year. The other problem, however, is that it means that necessary repairs will be spread out over a long period. The effect could be that (1) the building is seen to be in a constant state of renovation or that (2) the effect of the capital campaign is difficult to perceive, a situation that could make fulfilling one’s pledge seem less compelling. The church has very little debt, and, what it has, has been lent at a very attractive rate. We should be less timid about making commitments to maintaining our physical plant. If we need short-term loans to get work done in a timely manner—particularly in the case of urgent repairs—we should negotiate them. Tying our hands with a pay-as-you-go pledge is foolish window-dressing. I attended the Sangria & Sliders event at St. Paul’s this afternoon. It being very hot, the event was held in the lounge, rather than in the lounge and outdoors. That was probably just as well. Other items were available, but the main food provided included dinner-roll-sized hamburgers, sandwiches of pulled-pork or chicken salad, and, of course sangria. Millie Ryan and her husband Gary were responsible for the food, which was very good. A tri-fold brochure was distributed, whose cover can be seen at the left. The entire brochure can be seen here. The brochure doesn’t offer much more than parishioners have been told so far, but Lou’s presentation did give more details. The official kickoff event for the capital campaign will be October 15, though some people will be solicited for big contributions before then. The celebration for the completion of the campaign will be December 4. Pledges will be sought in parallel with the annual stewardship campaign, though Lou said that the stewardship campaign comes first—no one should reduce a pledge to the stewardship campaign to contribute to the capital campaign. Pledges to the capital campaign will generally be fulfilled over a three-year period. In the question-and-answer period, air conditioning the church again proved controversial. I asked if the job could really be done for $200,000 and was told yes, that cool air would be piped up through the floor. Some people argued that air conditioning is not needed. Lou, however, said that he thought air conditioning was the most important part of the campaign, that younger people expect a church to be air conditioned. Having church attendance go down in the summer is not a good thing, he added. I’m not sure that air conditioning will keep up attendance in the summer—people do go on vacation—but, basically, I think Lou is right. I said that parishioners should be given a list of what the $250,000 Property Maintenance Fund was intended to finance. Lou tried to duck this one, saying that unforeseen maintenance needs could not be predicted. I argued that much of what is in the campaign is deferred maintenance that should be funded in our annual budget. I asked when we will begin doing that, and was told that we simply have not had the money in recent years, but we will try to budget adequately for maintenance sometime in the future. What I didn’t say is that if we haven’t had sufficient funds to maintain our physical plant, we should have found the money elsewhere in the budget. If I’m not mistaken, St. Paul’s has a smaller congregation and a larger staff than it has ever had in the nearly quarter century I’ve been at St. Paul’s. Several comments were made about the $50,000 overhead of the campaign. Lisa Brown said she has been impressed with the woman from the Episcopal Church Foundation who has been working with the church. (ECF gets $30,000 for its assistance.) $6,000 is allocated to “miscellaneous expenses,” including postage and celebrations. Also included in the overhead is $14,000 for the feasibility study done last year. This is confusing to me, as that money was taken out of the Property Fund. If this money is being put back in the property fund, it is funding another $14,000 in maintenance. This needs to be clarified. I want to mention a couple of specific projects. Lou, for the first time in my memory, suggested that an automatic door opener would be installed on the handicapped restroom. I first identified a problem with the handicapped restroom door more than a year ago. I hope we do put an automatic door opener on the facility, but I would like to see this commitment in black and white. It shall be the duty of every Parish of the Diocese to lay before this Commission [on Church Architecture] the preliminary sketches of any new Church, Chapel, parish house or rectory, or of proposed changes of importance in any such existent buildings, and no such work of erection or changes shall be undertaken until the plans shall have received the approval of the Commission. The counsel and advice of the Commission shall be given in writing to the parish requesting the same within one calendar month after the receipt of the plans by the said Commission. Curiously, Lou, who serves with me on the Committee on Constitution and Canons, did not seem aware of this provision. How many people at St. Paul’s know that the choir includes a radio personality who is an expert on music of the ’20s, ’30s, and ’40s (and, perhaps, even the ’50s)? Long-time parishioner and member of the choir’s bass section Mike Plaskett is co-host of Rhythm Sweet & Hot (RS&H) on WDUQ-FM. He and Dale Abraham play music on the radio “that you won’t hear anywhere else.” It was not immediately clear that RS&H would survive the recent ownership change of 90.5 FM, but the show has been picked up and slotted into the 6–8 PM time period on Saturday nights. Those of you who have attended Mike’s Episcopal Café over the years, even if you didn’t know about RS&H, have surely suspected that Mike has a special affinity for the popular music of days gone by. I haven’t written about Mike before, as I didn’t think I could do him or RS&H justice, but I just read an essay about the show on a Post-Gazette blog (“‘WDUQ’s Rhythm, Sweet & Hot’ Lives! An Appreciation” by Rich Kienzle). Read Kienzle’s piece and tune in to 90.5 FM on Saturday night. ECF Vital Practices offers vestry members and other people of faith, resources and tools to respond to the changing needs of the Church. Building upon the spiritually grounded, practical Vestry Papers articles that have inspired and informed vestry members since 1995, Vital Practices uses the Internet to both expand its offering and its audience. 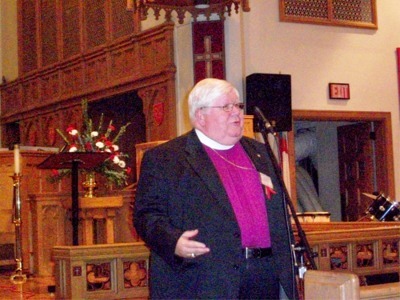 There is a good deal of material on the ECF site relevant to running an Episcopal parish. I must sheepishly admit that I haven’t read much of it, but then I am neither a priest nor a Vestry member. Apparently, a good place to start reading is the home page for the “Vestry Papers” section. The big topics on which you will find essays there include Administration, Buildings and Grounds, Communications, Conflict, Finance, Hospitality, Stewardship, Worship, and others. Depressingly, her first list is longer than her second. The essay nonetheless makes interesting reading. Check it out. Neither Lou nor Kris was in church today, so the 10:30 service was the John and Mabel show. It was good to see John Thomas back in church after his recent operation. Mabel Fanguy gave a nice sermon on not being judgmental, which she based, somewhat surprisingly, on the story of God’s asking Abraham to sacrifice his son Isaac. Almighty God, who has called us to be one body in the name of your Son Jesus Christ, send your Holy Spirit to encourage us to worship joyfully; teach the mighty acts of God; proclaim the news of Jesus; reach out with love and concern; and give our time, talent, and treasure to build the Kingdom of God; through your Son, our Lord Jesus Christ. Amen. I was delighted that we sang the first hymn (“A mighty fortress”) without anyone’s announcing that we were going to sing it. As best as I could tell, everyone stood on cue and sang the hymn without instruction other than what appeared in the bulletin. Likewise, we sang the presentation hymn sans announcement. The congregation is apparently smarter than it’s given credit for. This afternoon, I posted on Lionel Deimel’s Web Log, my other personal blog, a post titled “Pittsburgh Diocese Unexcited by Covenant.” It deals with comments made by parishes concerning the Anglican Covenant. All parishes of the diocese were asked to hold discussions on the Covenant; only six did. They included neither Calvary nor St. Paul’s. That’s too bad, as adopting or not adopting the Covenant could have serious consequences for The Episcopal Church. If you want to see what other Pittsburgh Episcopalians said about the Covenant, read my post. 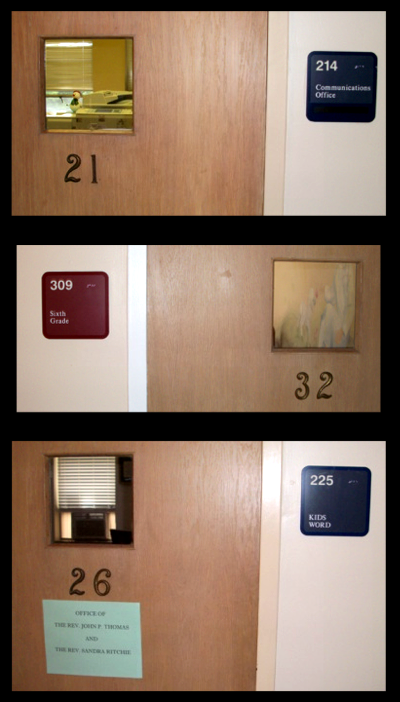 Anyway, shouldn’t we give each room a single number? Mostly, we simply have to remove the old brass numbers from the doors. In some cases, we may need to update signs. Why hasn’t anyone attended to this problem, which has been with us for years? Fraser, of course, is associated with a famous church that, in many ways, is quite different from the average parish church, whether in the U.S. or the U.K. He explained that “85 per cent of the congre­gation are visitors.” I don’t know what the corresponding number might be at St. Paul’s on average, but I suspect that it is closer to 2 or 3 per cent. For instance, I really don’t like being overly welcomed in church. Of course, I don’t want to be made to feel unwelcome, but I am not a fan of church greeters and similar meas­ures. While having the best of inten­tions, the message that they supply is often that the greeter (as a repre­sentative of the members of this local church) welcomes you (an outsider, visitor) to “our” church. When this happens to me, a little irritated voice in my head reflects that, although I have never been to this place before, it is as much my church as theirs. Giles’ reactions gives us something to think about. Are we welcoming visitors to “our” church or to Christ’s church? The ministers of the Church are lay persons, bishops, priests, and deacons. Whalon, a former Pittsburgher who is now bishop in charge of the convocation of Episcopal Churches in Europe and a frequent contributor to Anglicans Online, goes on to give his take on the proper roles of both laypeople and clergy. The ministry of lay persons is to represent Christ and his Church; to bear witness to him wherever they may be; and, according to the gifts given them, to carry on Christ’s work of reconciliation in the world; and to take their place in the life, worship, and governance of the Church. What then are clergy all about if they are not the primary ministers of the Church? Bishop Whalon sums up the task of the clergy this way: “The ordained ministry, of which episcopacy is the taproot, exists to serve the needs of the Church’s ministers.” Put another way, the job of the clergy is to empower the laity for ministry. On the other hand, most people experience St. Paul’s most of the time in worship. The Eucharist surely provides “food for the journey,” as Father John is wont to say, but what about preaching? The sermon offers the most direct mechanism for providing support for mission. Unfortunately, our Episcopal tradition seems to downplay the importance of preaching, and St. Paul’s is well in line with that unfortunate tendency. I cannot speak knowledgeably for other services, but I don’t generally feel empowered to carry out my mission as a Christian from listening to sermons at the 10:30 service. On Pentecost, for example, the emphasis was on our 175th anniversary and on being a welcoming congregation. Surely hospitality is part of ministry, but putting bodies in the pews is a narrow institutional view of the mission of the Church. As a worshiping Christian, I an looking for insights into how I should be living out the 167 hours allotted to me each week that I spend outside of church. I am not suggesting that we need more preaching on doctrine to tell us what we should believe. Converts are seldom attracted by dogma. Instead, Christians are won primarily through how we live our lives and by what we stand for. “Christian” has come to be identified with tolerance for corporate corruption, education that teaches what is demonstrably false, limitations on speech and action, and taxing the poor to support the rich. In such an environment, what would Jesus have his followers do? Isn’t this the sort of question for which sermons should propose answers? Of course, well-prepared ministers also need to know about the Bible and the Church. How many parishioners know that, for example, Paul did not write all the letters attributed to him, that the Bible contains many irreconcilable contradictions, and that there are other gospel books that were not accepted into the Christian canon? How many parishioners know that the doctrine of the Trinity is not set out in the Bible, that Christianity was more diverse in its first three centuries than it is now, or that the Church showed little interest in marriage for a thousand years, except possibly to discourage it? I was perplexed on Sunday when Lou cited the two stories about the gift of the Holy Spirit and suggested that we could simply choose between them. A teachable moment passed, and some worshipers surely left the church confused over two stories that seemingly could not both be “true.” Those folks were not empowered for ministry. I suspect that being “welcoming” at St. Paul’s includes avoiding giving offense to anyone. Sometimes, Christianity offers clear answers, but, sometimes, sincere Christians come to very different conclusions. (The abortion issue comes to mind.) Avoiding controversy, however, whether involving societal issues or theological ones, is not a means of empowering the laity for mission. A church that offers refuge from the world is avoiding mission, not facilitating it. We are in danger of being the lukewarm church of Laodocia spoken of in Revelation 3. Parishioners should demand more challenging preaching at St. Paul’s. If worshipers leave the church arguing among themselves about what has been said, we will be showing signs of success in creating excitement about being Christian in a broken world. The tune, played using slightly different rhythm, can be played blow. If you find it difficult to appreciate the poetry from the hymnal page, you can read the words alone here. One of the joys of being at St. Paul’s for many years is watching our young musicians mature. Over the years, I have seen a number of our children grow up to become professional musicians. It was an e-mail message to the choir from Doug Starr that got me to thinking about this. 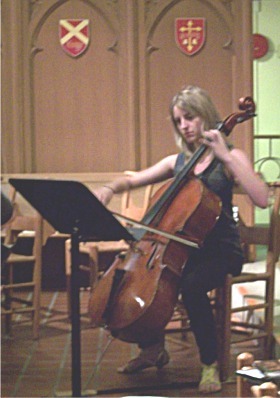 Cellist Alexandra Thompson will be playing Bach and Purcell at this Sunday’s 10:30 service. Allie has just graduated from Cleveland Institute of Music and will play with the National Repertory Orchestra this summer. She then moves to Miami’s New World Symphony, whose music director is Michael Tilson Thomas. My favorite “Allie story” happened during one summer of her high school years at the prestigious Interlochen music camp in Michigan. After hearing Allie expertly accompany Baroque music (as she will do in Sunday’s offertory anthem by Henry Purcell), playing the continuo bass line giving both foundations to the harmonies and providing a weaving solo bass line against those lines in the upper parts, her teacher asked where she learned to play continuo. “In church!” she gleefully answered, which should give us all pride in our support for a music ministry that gives glory to God in worship and thanksgiving for God’s blessings in our talented youth. Worship at St. Paul’s at 10:30 Sunday, and you can hear and support Allie. Some day, you’ll want to say you knew her when …. As I mentioned in my last post, I attended the 8:45 service at St. Paul’s this past Sunday. I did so for convenience, but I was also interested in seeing what the service was like, as I had not attended an 8:45 service for some time. I was also interested in seeing what attendance was like, but Sunday School teachers were being honored, and that clearly increased the size of the congregation and the number of children present. My experience began badly. Because I was close to the stairs nearest Mayfair Drive, I walked up those stairs to get to the church. I found no service leaflets there. It soon became obvious why; the musicians made it impossible to enter the church through the south transept. I tried going in back of the chancel, but the door was locked. Instead, I had to return to the undercroft and walk up the other flight of stairs. I was given a booklet and found a seat in the nave. The service booklet was relatively free of errors, I am happy to say. (I found things I would change if I were editing it, but most of those lapses would go unnoticed by the less obsessive.) I did find that the addition of “A beacon of Christ’s love for 175 years. 1936 - 2011” at the top of the cover and “175th Anniversary” at the bottom of the cover made the page look rather too busy, particularly since the descender of the final “y” of “Anniversary” was cut off. Also, on the calendar, I did wonder if the EYC End-of-Year Cookout was really going to be held in the youth room. Serious errors, however, were not in evidence. A few aspects of the service surprised me. Clearly, the service is intended to be friendly and contemporary, though, in most ways, it is really rather conventional. For a contemporary service, I was surprised that the traditional version of the Lord’s Prayer was said. (Does anyone use the more modern version in the prayer book?) I was surprised, too, that most of the Easter blessing in the service booklet was skipped, though perhaps this was an oversight. As was the case at the 10:30 service when the bishop visited, “God” was substituted for “him” at the beginning of the Great Thanksgiving in the service booklet . (See “Putting Our Best Foot Forward?”) Finally, I though it odd that the pulpit was not used for reading the lessons. Instead, a lectern—or perhaps it was simply a music stand—was employed. No doubt, this is done out of some mistaken sense of democracy. The pulpit is located where it is so the reader can be seen. Other than the sermon, the most conspicuous distinguishing feature of the 8:45 service was its music. Much “contemporary Christian music” or “praise music” is—not to put too fine a point on it—simply awful. I had hoped, however, that when St. Paul’s used more modern music, we would select from the better material that’s out there. Sunday’s service was not encouraging. More of You in my life. And I will worship You with all of my strength. standin’ in the need of prayer. Savior of the peopple ]sic]. Notice that the corporate “we” of the traditional creed is replaced by “I,” consistent with use in the rest of the music. More significantly, however, the creed has been stripped of virtually all of its theology other than an acknowledgement of the Trinity. Our fourth-century forebears who worked so hard to hammer out the Nicene Creed would be appalled at the way their work has been castrated here. Instrumentalists played the Clavinova, drums, three guitars, and violin. There was one singer who played no instrument. It was difficult to tell how well the ensemble worked together, as it was often difficult to hear anything but the drums and (perhaps) the Clavinova. (Churches with bands often place their drummer within a Plexiglas box to achieve a more reasonable balance of sound.) An unlisted piece was played and sung by the musicians during communion, but I found it impossible to understand the words. Because the musicians were standing just inside the communion rail, I was wondering how we were going to do communion. As it turns out, we distributed the elements at stations, which avoided the use of the communion rail completely. To sum up, I thought the music was very bad, and it did not seem to be performed, either by the musicians or the congregation, with any great enthusiasm. I left the service feeling seriously depressed. Admittedly, we used the prayer book (mostly) and celebrated a Eucharist, but the whole spirit of the affair was very Protestant and very Evangelical. Evangelicals do this kind of service much better than we can. Why do we not just let them do it? I find our mission statement wanting in a number of respects. It begins with a slogan which is surely untrue, and proceeds to offer a laundry list of what St. Paul’s does. One gets the impression that, should we take on some new project, we will simply append it to the laundry list. Writing mission statements for churches is difficult, since most churches do basically the same things. Identifying a special role—charism, even—of a particular church can be tough, but, if the exercise is useful at all, it needs to identify not what churches generally do, but what is special about the particular church in question. The St. Paul’s statement fails in its being too long and diffuse. A good mission statement helps an organization decide, when faced with a proposed project, whether that project enhances its mission or is a diversion from it. It is not clear that any reasonable project that might be proposed for St. Paul’s would ever be rejected as inconsistent with our mission statement. Under our current rector, we have expanded our three weekend services, each of which was distinctive, to five. The new services are very different. Whereas both the 8:45 service and Refuge follow, in a general sense, the prayer book, one seems aimed at the lowbrow, egocentric Protestant, and the other seems aimed at the equally self-absorbed seeker who is skeptical of organized religion. Neither of these audiences is unworthy to be served by the Christian Church, but are they really the people best served by our parish? I worship at St. Paul’s for two reasons. First, it is an Episcopal church that is close to home. 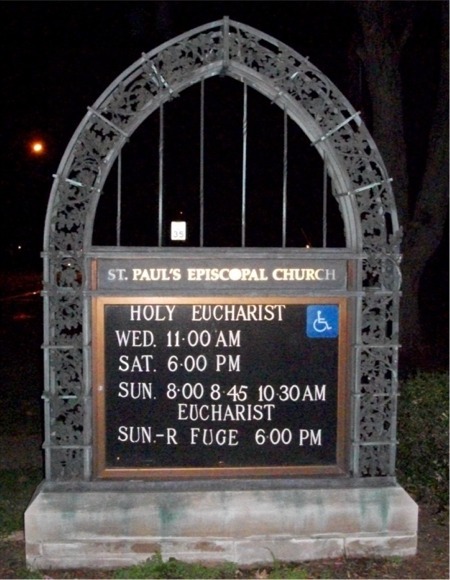 If St. Paul’s shut down tomorrow, I would look for another Episcopal church. Second, I attend St. Paul’s for the music. If the music at 10:45 deteriorated in quality or changed its character substantially, I would leave in a minute. 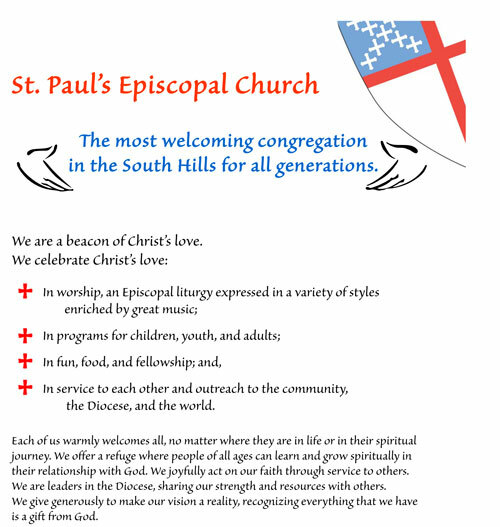 Although these are clearly not the reasons others attend St. Paul’s, over most of the 24 years I have been at St. Paul’s, the parish’s most conspicuous asset has been its ability to do mainstream Episcopal liturgy really well. Of course, the parish was also engaged in doing what churches in general and Episcopal churches in particular do, but I have felt that traditional worship well done was our calling. Second, we have to ask if members we attract with our new services are the kind of members best served by a traditional Episcopal parish. Not everyone needs to be (or should be) an Episcopalian. The 8:45 service is the kind of service done by many other churches that can do it better and whose congregations are more likely to seem compatible with new members attracted by it. In the worst case, members brought in by our new services will have different ideas about how we should worship, and this could be a threat our more traditional services. Already have the new services affected our worship space. A modesty screen has been removed from the south transept, which is now both unsightly and unusable for seating because of the instruments, audio equipment, and outright junk that now permanently reside there. (See “Clutter.”) Cables snake across the floor, representing a tripping hazard, and unsightly speakers flank the extension of the chancel. No doubt, our new sound system will be influenced more by the needs of our band than by the need to reinforce speech and to record musical performances. How long will it be before we dump our 8:45 service booklets and project PowerPoint slides on a screen at the front of the church? By now, you may be thinking that I am inflexible and paranoid. Perhaps so. But I fear that St. Paul’s is trying to be all things to all people, and this seldom works for any organization. We should stick to what we’re good at (or what we think we can be good at) and not worry about serving everyone. 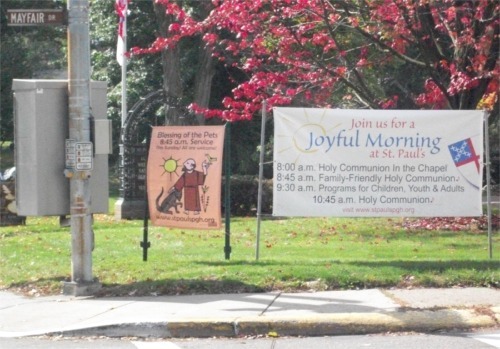 Our parish is neither big enough nor rich enough to be adding worship services geared to every niche market we can identify, particularly when we are having trouble paying our staff and can afford no money from our operating budget for outreach. Let’s do what we do well, and let others do well the things we can only do poorly.